So much fun. I can just hear the shouts now and the little stomping feet. That was how today's artisan became the mommy of Flannel Monsters for everyone! 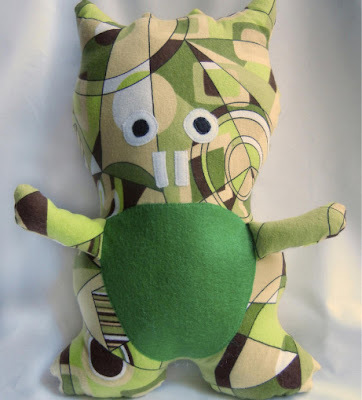 Flannel Monsters is a creative website on the internet filled with some of the cutest plushie monsters you'll ever see. Megan, the artist behind these wonderful creations, was inspired by her son on the impending arrival of her son's first birthday. He loved monsters and spend a lot of his time stomping around the house saying "Monster goes ROARRR!" Fed up with cheap-o toys and party favors from the commercial market, she decided to make everything for his party herself and that included stuffed monsters for him and his friends! That was the rebirth of her childhood love of sewing and the birth of a business as well! Now you can visit her website and browse through tons of terrific monsters just waiting for someone to come along and take them home and give them some love. Megan makes each and every one as if she's making them for family and loved ones and she's always finding new ideas and inspiration to keep her creative juices flowing and new monsters coming! YOU CAN CLICK ON THE PICTURES ABOVE TO VISIT THE FLANNEL MONSTERS WEBSITE AND TAKE A LOOK AROUND OR, IF YOU PREFER, YOU CAN CLICK RIGHT HERE. 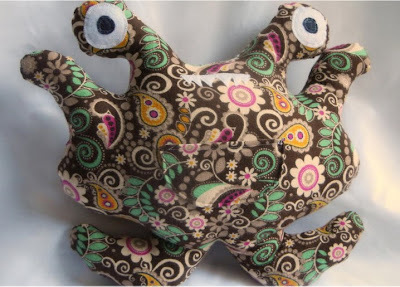 You can also visit Megan and her monsters on the Flannel Monsters blog or stop by and say hi on Facebook! Today's artisan is a woman after my own heart. Like myself, she has a great love for books. Their smell, their appearance. How they feel. What they represent. Teo, from Portugal, is a book lover at heart from the top of her head to the tips of her toes and those talented fingers, as well as a freelance artist. She comes from a family of painters and craftsmen and has carried with her a love for arts and crafts since childhood. 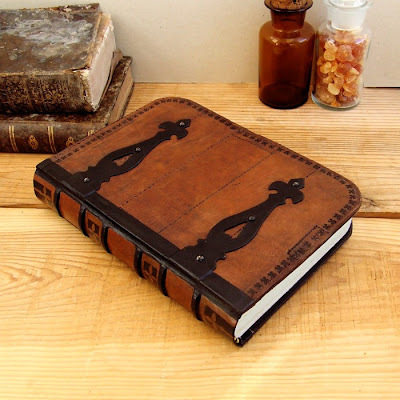 At TeoStudio on Etsy, Teo offers beautiful books with a vintage flair and breathtaking craftsmanship that she's created by hand while trying to preserve as much as possible the reality of the materials she uses and bring to light their beauty through craftsmanship and conservation. With an eye for artisan beauty and the skills to make beautiful books that will last forever, Teo has carved herself out a niche on Etsy that is both breathtaking as well as fascinating. You'll love a browse through her shop, and if you're anything like me, be tempted to buy out every piece she has in stock! And, for even more enjoyment, this is a shop that I also recommend browsing through her sold items. There's over 200 to browse through and because each of her pieces is a beautifully crafted piece of artwork, you're sure to enjoy taking a peek through there as well! 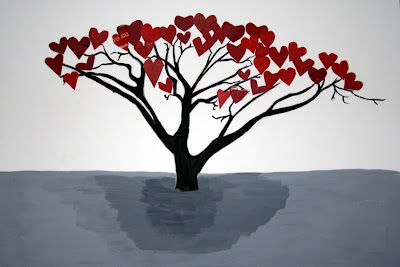 YOU CAN CLICK ON THE PICTURE ABOVE TO VISIT TEOSTUDIO'S SHOP ON ETSY AND TAKE A LOOK AROUND OR, IF YOU PREFER, YOU CAN CLICK RIGHT HERE. You can also visit Teo on the Teo Studio Website or stop by the Teo Studio Blog for a quick visit as well! Paintings and beads, sculpture and jewelry. Drawings and much much more... that's what today's shop has to offer. BunnyKissd on Etsy is filled with fun and colorful bits of clay, pendants, beads and more to make you go "awwww!" and give a smile. Diana, the artist behind BunnyKissd, is filled with artistic wonder and loves to express herself with a wide variety of mediums from paper, paint, glue and scissors to polymer clay, pencils, watercolors, photography and even the occasional computer art! 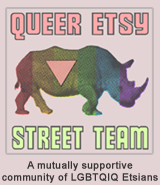 She's a member of a number of teams on Etsy that I'm also involved with including the Etsy Bloggers Street Team and the Queer Etsy Team. 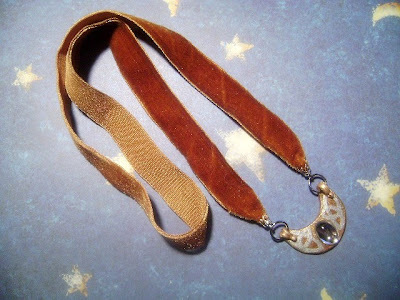 My favorite piece in Diana's shop at the moment is the beautiful crescent moon necklace you can see pictured here in this post. I have to admit, though, it was a hard debate for me because she has some of the cutest winter ornaments with s'mores and other marshmallow and snowman themes as well and they're all very cute. And also the hungry caterpillar sculpture that made laughter bubble the minute I saw it as well! YOU CAN CLICK ON THE PICTURE ABOVE TO VISIT BUNNYKISSD ON ETSY AND TAKE A BROWSE AROUND OR, IF YOU PREFER, YOU CAN CLICK RIGHT HERE. You can also visit Diana on her BunnyKissd blog as well!